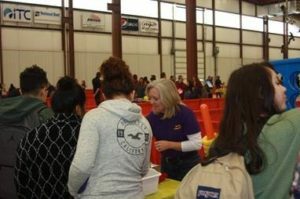 On Tuesday, October 31st, Dodge City Community College held its 4th annual Career Expo at the Ford County Expo Center. A combined total of 1,181 high school and middle school students were in attendance from schools all across southwest Kansas and as far as Forgan, Oklahoma. The Career Expo originally began as a way to showcase Tech programs at DC3, but it has grown to include academic programs as well as campus clubs. “This event is wonderful in the sense that not only are we able to showcase all of the wonderful programs and opportunities that DCCC has to offer, but it also allows prospective students the opportunity to interact with faculty members that teach the courses, as well as to get firsthand insight into what classes will be like,” said Ryan Ausmus, Dean of Instruction and Title V Project Manager. Several students, faculty, and staff were on hand to provide information, showcase programs, and give guidance to potential future students of DC3. “It also gives prospective students the opportunity to interact and to hear from current DCCC students about courses, coursework, and college in general,” Ausmus said.